SchoolBrains is a Student Information System that provides a comprehensive set of tools and features for schools to help them in the efficient the data management. Designed primarily for the K-12 schools, the SchoolBrains offers customizable online portals for school administration, teachers, students, and parents to manage their data. SchoolBrains provides a platform the users where they can access the school information according to their roles. The features and tools that come with the SchoolBrains include admission management, grading and report cards, educational plans and calendar, course mapping, lesson plans, and assessments. The solution also provides a platform for the teachers and parents to communicate with each other and discuss the performance of the students. SchoolBrains is a web-based solution which ensures that the school data gets a reliable backup. Moreover, the schools don’t need any on-premise installations to run the application, nor do they need to have any expertise in running the software. The users can access the information from anywhere through a device with internet connection. The permission-based access and other security protocols ensure that only the authorized personnel have access to the sensitive data. Being an online solution, all the important notifications and updates can be received in real time. The students and parents can download the exam date sheets, performance reports, and calendars anytime from anywhere. In classrooms, SchoolBrains helps the teachers and administration in attendance management, course planning and management, tracking student performance, and developing grade books. The SchoolBrains also helps the health professionals in schools to track and monitor the health records of every student. The software provides them with the student’s complete health record in a few clicks. The emergency response system allows the school administration to send instant alerts to the students, teachers, and parents through voice messages, text messages, and emails. The SchoolBrains is also available through the app on iPhones and iPad. Users can have access to their portal and most of the other features on mobile or a tablet. The software is fully customizable and schools can make changes to the solution and add/ remove features according to their specific requirements. 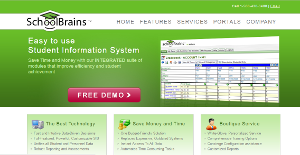 There are popular and widely used applications in each software group. But are they necessarily the best fit for your organization’s unique wants? A market-leading software application may have thousands of subscribers, but does it provide what you need? For this reason, do not blindly shell out for popular systems. Read at least a few SchoolBrains reviews and mull over the factors that you desire in the software such as the fees, main tools, available integrations etc. Then, select a few apps that fit your wants. Check out the free trials of these platforms, read online reviews, get clarifications from the vendor, and do your investigation thoroughly. This in-depth research is certain to assist you choose the most excellent software platform for your company’s specific requirements. How Much Does SchoolBrains Cost? The base price is $200/month and a per-student amount is charged on top of the base price. The price increases with the number of students and added features. Contact the company to obtain more enterprise pricing details, or request a free demo to see whether SchoolBrains is the perfect fit for your needs. We realize that when you make a decision to buy Learning Management System - LMS it’s important not only to see how experts evaluate it in their reviews, but also to find out if the real people and companies that buy it are actually satisfied with the product. That’s why we’ve created our behavior-based Customer Satisfaction Algorithm™ that gathers customer reviews, comments and SchoolBrains reviews across a wide range of social media sites. The data is then presented in an easy to digest form showing how many people had positive and negative experience with SchoolBrains. With that information at hand you should be equipped to make an informed buying decision that you won’t regret. What are SchoolBrains pricing details? What integrations are available for SchoolBrains? If you need more information about SchoolBrains or you simply have a question let us know what you need and we’ll forward your request directly to the vendor.